Richard Bach? Jess Lair? Anonymous student? Sting? Peter Max? Chantal Sicile? If you love something, let it go. If it returns, it’s yours; if it doesn’t, it wasn’t. The statement immediately above was attributed to Richard Bach who wrote the enormously popular inspirationally work “Jonathan Livingston Seagull” in the 1970s. But I cannot find this saying in his novels. Could you tell me where this expression came from? 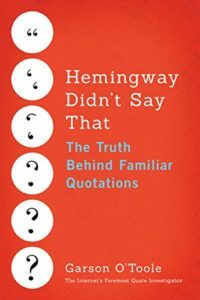 Quote Investigator: QI has found no substantiation that Richard Bach created or used the phrases above. If you want something very, very badly, let it go free. If it comes back to you, it’s yours forever. If it doesn’t, it was never yours to begin with. 1. I heard a very profound statement last night. Unfortunately I’ve forgotten it. 3. Laughter is the song of the angels. Lair did not require the words to be original, and he did not request attributions. So the student may have gathered the quotation of interest from another unknown person. Top quotation expert Fred Shapiro, editor of the Yale Book of Quotations, obtained a copy of the 1969 book recently and verified the presence of the passage. Lair published multiple editions of his book, and in the past a 1974 edition was the earliest known and verified copy [JLYQ] [JLQV].